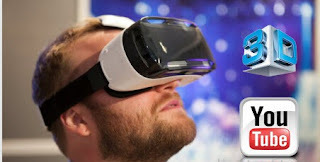 360 videos had been a huge success since it appeared on YouTube last year, and over time, more 360˚ videos had been uploaded and watched millions of times everyday, but what if you would like to keep or download the video to your PC or smartphone, to watch it anytime with your VR headset? Sure, You can download the 360 video to play the 360 video quality with your VR headset using PC or Mobile (Windows, Mac, Android, iOS). Once you get those, you're good to go and enjoy your 360 video. Really, it's just a matter of downloading the source file (commonly referred to as the "flattened" video file, or technically known as the "equirectangular" video file) and then playing it back through a dedicated 360 degree video player which knows how to map/wrap/project the equirectangular source file into a sphere for interactive 360˚ playback. This is easy too, and almost same method as for PC. Download the 360 video in the highest quality possible via existing YouTube download sites such as www.keepvid.com or Savefrom.Net , once you have the MP4 file, you can play it back in a 360˚ Video Player for Android or iOS. There are more cool VR players pr Apps for those mobile operating systems which we may detail you in our upcoming posts. Hope this post was useful and helped you play Youtube 360 videos on your PC or mobile.